Looking for the perfect way to add a little shine to your modern kitchen? 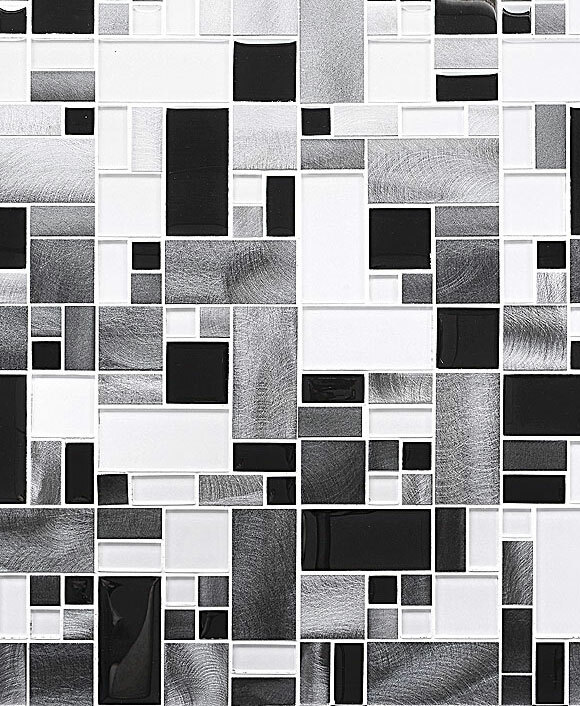 Look no further than this white glass metal backsplash tile. The tiny metal inserts scattered throughout give a mirror effect that bounces light around your kitchen for an open and airy feel. Make the most of the natural light or artificial light that abounds in your contemporary kitchen by allowing this gleaming metal to do some of the work for you. When paired with the mixture of metal and glossy white glass backsplash tiles, it is sure to dazzle your guests. Perfectly complemented by crisp white cabinetry, let your cabinet doors have a classic design with simple brushed nickel hardware. The additional burst of clean coloring will give your kitchen an even brighter feeling, ideal for entertaining or just absorbing the atmosphere. Stainless steel appliances and gleaming metal light fixtures will add an extra layer of shine and will play off the metal insets for a radiant kitchen that looks professional and well designed. A gorgeous Luna Pearl granite countertop will balance this mosaic backsplash tile with its swirls of white and gray tones. Though any white and gray kitchen countertop combination would look amazing with this white glass metal backsplash tile, the Luna Pearl granite reflects the light of this mirrored tile for an even cleaner and more cohesive modern design backsplash ideas. Worried your kitchen will be too humdrum with only a white and gray color palette? Add livelily and bold accent colors with smaller pieces that will be easier to change over time when colors go out of style. Useful items in bright shades, like the stand mixer in this kitchen, are great ways to feature lively colors without overwhelming your space. Modern designs typically call for clean spaces without much clutter, so items that will be frequently used would be best to adorn the counters for practicality and simplicity. Mixing various colors this way is ideal for keeping your modern space feeling fresh through the years as you mix new color trends into an otherwise timeless and elegant neutral color scheme. Let your modern kitchen design become the envy of all your friends with this unique pattern of white glass metal backsplash tile. Mix and match whites, grays, and shiny metals for a kitchen that sparkles and gleams, designed to dazzle all of your guests. It’s sure to become a sophisticated focal point for your contemporary to modern kitchen backsplash ideas with its radiant beauty. This entry was posted in GLASS, GLOSSY, GRAY, METAL, MOSAIC, WHITE. Bookmark the permalink.